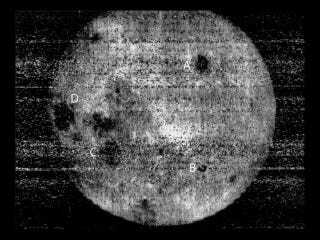 Exactly 54 years ago, the Soviet Union’s Luna 3 Probe opened its camera shutter and snapped the first pictures of the lunar far side — a sight that had eluded human eyes since the beginning of time. For millennia, human eyes have seen only one face of the moon. Put a dude from the Iron Age in a time machine and whisk him to 2013 and he’d see the same pattern of light lunar highlands punctuated by dark grey spots you see. Night after night after night. That all changed 54 years ago today when the Soviet Union’s Luna 3 probe opened its camera shutter and snapped the first pictures of the lunar far side. Though blurry and banded with electronic noise, everyone who saw them sat up in surprise. The backside barely resembled the front. It lacked in the familiar lunar maria, the dark spots that we instinctively patch together to form the face of the “man in the moon”. Only two dark ovals were seen, Mare Moscoviense (Sea of Moscow) and the lava-filled floor of the crater Tsiolkovsky, named for Konstantin Tsiolkovksy, the Russian rocket pioneer. The rest, which looks like dried paste, is jammed with craters and related the near side’s light-toned, cratered highlands. Both are remnants of the original lunar crust that solidified as the moon cooled after formation. Darker areas or “seas” are more recent basaltic lavas that welled up to fill huge impact scars left by colliding asteroids. They contain iron-rich minerals from deep beneath the crust which make them less reflective, hence darker in comparison to the highlands. The moon hides its back or far side through a neat trick – it rotates at the same rate as it revolves around the Earth. Normally, rotation would bring new features into view, but every little bit it turns, it moves an equal amount along its orbit, hiding what would otherwise be exposed. It’s called synchronous rotation or tidal locking. Most of the larger moons in the solar system are tidally locked to their planets. Jupiter’s four biggest and brightest moons are a great example. Equipped with both wide angle (200 mm) and telephoto (500 mm) lenses, Luna 3 took 29 pictures covering about 70 percent of the far side during its loop around the moon. The first picture was shot from 39,500 miles away (63,500 km), the last taken 40 minutes later from 41,445 miles (66,700 km) distant. After the photo session was done, the probe passed over the moon’s north pole and headed back toward Earth. Temperature and radiation-resistant film used for the photos was automatically moved to an onboard processor where it was developed, fixed and dried. A cathode ray tube then shot a beam of light through the film and onto a photoelectric multiplier, a light-sensitive device that converted the different gradations of tone into electric signals which were then transmitted to Earth. Almost sounds like a fire brigade, but hey it worked! So what’s the reason for the moon’s split personality? We know the far side crust is 50 miles (80 km) thick versus 37 miles (60 km) for the near side. A thicker far side crust may have prevented magma from reaching and flooding the surface as they did on the near side. Heat released by the decay of radioactive elements also may play a role. NASA’s probe found more on the near side, where they may have encouraged the formation of hot magmas that eventually found their way to the surface. What caused the fascinating asymmetry is unknown, but it may have to do with the slowing of the moon’s rotation into its present tidally-locked state under the heavy hand of Earth’s dominating gravitational influence. This article originally appeared at Universe Today and is republished with permission.